Sounds and voice don't work correctly on modern versions of Windows (see Crashes constantly for the necessary fixes). Chessmaster Live online multiplayer service has been shut down. cm.ini contains general game settings. Other *.ini files do not need to be edited. Saves can be saved anywhere (the default is the installation folder). Chessmaster Live servers have been shut down. 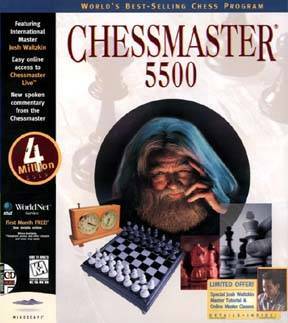 Chessmaster 5500 relies on a VXD driver that is not compatible with Windows XP and later. This error appears even if SmartBoard is disabled in the settings. Chessmaster 5500 crashes constantly on Windows XP and later because of a sound incompatibility; the changes below prevent these crashes. Right-click Cm5500.exe or one of its shortcuts. Enable Compatibility mode and choose Windows 95.